By Larry Levin. Grand Central Publishing. $19.99. This heartwarming narrative travels through one emotional crossroad after another, leaving the reader gasping and grappling at times about the best and worst of man’s far-reaching treatment of the dog. The worst – neglect and dog fighting – surface early in stark contrast to the best – commitment by a dedicated veterinary team and a special family. The cover photo of this once-maimed bait dog is enough to put this passionate and empowering read in your hands. Levin, a Philadelphia area attorney, beautifully details how Oogy came into the family’s life on the day in 2002 its beloved senior cat Buzzy was euthanized following a lengthy illness. In other words, 4-months-old Oogy quickly becomes Buzzy’s legacy in a sudden and decisive manner. Oogy is found by police during a raid and taken to a nearby veterinary hospital, where the after-hours emergency staff tends to some of his bite wounds but leaves him in a small cage without follow-up treatment for hours. Many label Oogy a pit-bull, but he is a Dogo Argentina, a breed known for ferocity and devotion to family. Despite abuse and neglect by a dog-fighting ring, dozens of ailments, including the loss of an ear, and undoubtedly extraordinary pain, the white puppy never stops wagging its tail. Not a fighter in sense of sport, the brutalized dog never quits fighting for life, however. Diane Klein, his hospital-staff rescuer and biggest advocate, briefly fosters the dog before it moves on to the Levin household, which includes Larry, his wife, Jennifer, and adopted sons, Dan and Noah. “He was so happy to be where he was that he almost seemed to be carrying an electric charge,” recalls Levin. Disciplining a dog that has lived a life of horror, poses problems for Levin. Consequently, Oogy’s appetite for mass destruction of countless personal items and furniture continues unabated for almost two years. But the family’s love affair with this white knight only intensifies as he continues to exhibit mischievousness and playfulness. The twins quickly embrace Oogy, who becomes known as “the third twin” in the process. Following his rescue and having his battered face stitched back together, Oogy’s second home becomes a couple veterinary hospitals, one his primary practitioner and another a specialist. In the process he undergoes four major surgeries, and remarkably his trust in the Levins increases with each. “He knows that we will alleviate his pain. He knows that we will do the right thing for him. His faith in us calms him and calms us,” Levin emphasizes. 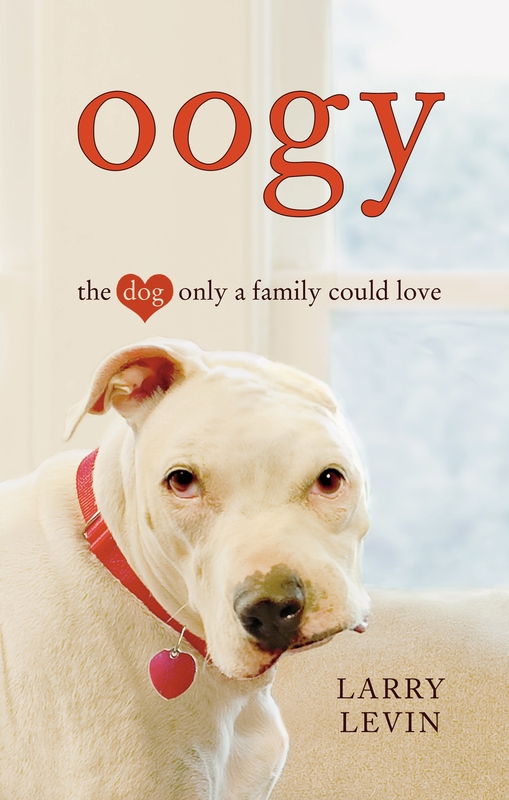 “Oogy” is a love story you won’t soon forget. Its earthy life lessons are rich, insightful and powerful, thanks to Levin’s crisp prose and brisk narrative which entertains and enthuses throughout the memorable journey.